Have you ever wondered what it would be like to blast through the atmosphere and into space itself? Thanks to online casino Royal Panda, this magical feeling is precisely what one lucky Starburst player can look forward to experiencing firsthand. Could that player be you? 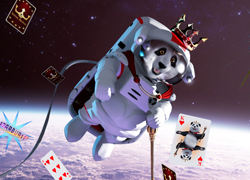 You’ll need to enter Royal Panda’s space trip promotion to find out. The competition rules couldn’t be simpler. All you need to do is register for an account at Royal Panda and fire up video slot Starburst in real money mode. Be the first person to attain the highest combination possible, and you’ll have won yourself a trip into space worth over $100,000. Newly registered players can double their chances of winning by taking advantage of Royal Panda’s first-deposit bonus. This matches your first deposit up to 500 zł, and spins made using your bonus money also count. The fact Royal Panda has selected a game with the popularity of Starburst is also a big plus. With its slick and stylish graphics, fantastic gameplay features and a jackpot of 50,000 coins, you’re assured of a good time when you’re playing, regardless of whether you win or lose. And of course, every real-money spin you make will also earn you Loyal Panda Points, which can be redeemed against everything from iPhones and tablets, to further deposit bonuses. Given the unique appeal of a genuine space trip, we’d strongly advise anyone wanting to enter to do so sooner rather than later – such a genuinely out-of-this-world prize as this is likely to attract lots of attention, and you won’t want to find you’ve missed the (space)ship. So what are you waiting for? Register at Royal Panda now and get those Starburst reels spinning!